Although most research on entrepreneurship policy occurs at the national level, entrepreneurship is in critical ways a local phenomenon. Surveys of entrepreneurs around the world indicate that much conventional wisdom about these policy areas is misleading or simply wrong. The authors then leverage those findings to prescribe a series of key activities and policies that leaders can leverage to promote entrepreneurship, enhance prosperity, and create job growth. The garment industry provides a vital first step out of poverty for tens of millions of mostly female workers globally—and an alternative to low-skilled agriculture and service work. But it has long been associated with low wages, long hours, discrimination, abuse, and other conditions that put workers’ health and safety at risk. "Women globally and particularly in developing and emerging economies need more good jobs. This is vital to tackling persistent gender gaps—a development imperative if we are to achieve our goals of ending extreme poverty and boosting shared growth," WBG Senior Director for Gender Caren Grown said. "This report highlights important links between better work and better lives for women and men, and better, more inclusive growth." The Better Work Program trains local monitors to make unannounced inspections and bring factories into compliance with national laws and international standards through auditing, advisory, and training services. As of 2014, according to Better Work, the program had helped improve working conditions for some 1 million workers in more than 1,000 factories across eight countries—Bangladesh, Cambodia, Haiti, Indonesia, Jordan, Lesotho, Nicaragua, and Vietnam. Over the last century, many countries have expanded labor-intensive apparel production as a means out of poverty. The sector broadly has a reputation for low-quality jobs with low wages, long hours, high temperatures, excessive noise, poor air quality, unsanitary environments, and verbal and physical abuse. For millions of women in developing countries, however, the garment industry provides unique economic opportunities. Field research in four countries—Cambodia, Kenya, Lesotho, and Vietnam—found similarities in how workers in each country defined "job quality": To them, a “good job” meant fair pay and benefits, collegial relations with managers and supervisors, and work-life balance, facilitated by reasonable work hours. Better Work factory employees are applying their new experience and training to their jobs but also elsewhere: Workers from Cambodia, Vietnam, and Lesotho all said improved communication at home and decreased stress at work was boosting satisfaction with their family lives; in Vietnam and Cambodia, men and women alike said household chores and decision-making were now shared equally. Drawing on NESsT’s unique methodology for identifying and building the capacity of early-stage social enterprises, as well as on surveys of relevant stakeholders, this book provides a clear picture of where social enterprises are and where they need to go, and identifies key players in the social enterprise field and how they can take the bold steps needed to facilitate the growth and impact of these models. Nicole Etchart and Loïc Comollï (NESsT’s Co-CEOs) focus on NESsT’s research in Latin America and Central Europe, the two regions where it has operated for over 15 years, particularly in Argentina, Brazil, Chile, Ecuador, and Peru, with some cases from other countries in Latin America. For the purpose of illustrating important models and innovative programs and policies, this book also highlights cases and experiences from Central Europe. This publication is intended to raise awareness of the impact of social enterprise supply chains on society and the benefits for companies that do business with them in Peru. These pages contain many examples of companies that work with social enterprises to meet their corporate and social responsibility objectives, as well as a directory of Peruvian social enterprises that are potential suppliers for major businesses around the country. With this guide we hope to inspire the representatives of Peruvian companies and give them the courage to explore new business models that meet their operational needs while generating a positive and lasting social and environmental impact. Thanks to public policies promoted by governments, social enterprises have been able to develop more strongly in Europe, where it is estimated that the entire social economy involves over 11 million people, about 6% of the active labor force. It represents USD 92 billion of the UK economy, with more than 2 million jobs, while in the U.S. it is estimated that the sector represents 3.5 % of GDP and 10 million jobs. Latin America is lagging behind in this respect, where there is still no legal or regulatory framework for social enterprise or recognition of the potential of these businesses to address critical social issues. At the same time, there is growing evidence that the State can play an important role in helping this sector to grow and have the impact that it has demonstrated in other countries. Positioning Social Enterprises in the Public Agenda: Road to Travel, grew from both this concern as well as this opportunity. The authors set out to document, understand and disseminate good practices in policies for social enterprises, and ultimately to contribute to the development of the sector in Latin America and globally. The book introduces a model of how to position the issue on the public agenda in a way that responds to the most urgent social needs of the country and the sector, building on existing local policies as well as those from other countries, and involving stakeholders in permanent dialogue. The Road to Travel, aimed at public policymakers and key sector players, includes 34 cases of best practices in public policy and a strategy to move faster to address our most intractable problems through a new economy. What is social enterprise and philanthropic capital? How does it differ from traditional charities and donations? Why should philanthropists engage in social enterprise development? What are the opportunities to grow social enterprises and their impact? How can philanthropists learn more about the sector? How can they conduct due diligence on social enterprises and intermediaries? What groups or individuals are successfully growing social enterprises? NESsT and the Charities Aid Foundation, two organizations with extensive experience and leadership in the field, have produced a guide for philanthropists and social investors interested in learning more about how philanthropic capital —funding from philanthropic sources used in an entrepreneurial and sustainable manner— strengthens and expands social enterprises. International private equity offers an unprecedented opportunity to accelerate economic development in sub-Saharan Africa. It has been the fast growing capital flow to the region with more than $50 billion annually and a 20 percent of cross-border capital flows. In this working paper, the Overseas Development Institute (ODI) looks at plicy priorities to capture the benefits of international private equity. Download the full paper here. In this white paper, Echoing Green shares insights from its Fellowship semifinalist applicants and Fellows seeking to change the world through for-profit business models. Download the report here. Gender matters all the time, whether we're investing in women-led businesses or in companies that market goods to women. It matters in transportation infrastructure, national debt, and in the future of industry. Gender is about so much more than counting women and girls and how they are represented. This report from the Criterion Institute tells the story of gender lens investing over the last five years and draws up a roadmap to the future. Download it here, or from the Criterion Institute site. The new study provides an objective, rigorous look at two of the most important aspects of impact investing: financial returns and long-term impact. 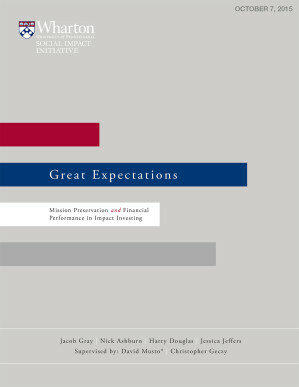 Specifically, the study explores the widespread assumption that impact investing private equity funds cannot achieve market-rate financial performance. The report’s findings suggest that – in certain market segments – investors might not need to expect lower returns as a tradeoff for social impact. Impact investing is an investment approach that intentionally seeks to generate measurable social or environmental impact alongside a positive financial return. According to the study’s authors, certain market segments of funds in the sample yield returns close to those of public market indices. The new study evaluated the financial performance of 53 impact investing private equity funds—representing 557 individual investments—relative to public market indices such as the Russell 2000 and other benchmark indexes. The study also sought to determine what one might expect to happen to a portfolio company’s social or environmental mission when its impact investors seek liquidity. This report also generated a lot of buzz at ANDE's 2015 Annual Conference session on Exits in Impact Investing. Make sure to view the report on Issuu or download a PDF version here. Click here to read the Executive Summary in English and here to read it in Spanish.